Below is a list of public conservatories, mostly in the United States, of greater that 10,000 sqft in display space, or special architectural or historical significance. The list may be slightly out of date. I have provided links to satellite views ( through Google ) as well as links to their informational webpages. North America's oldest existing wooden public conservatory. Over 100,000 plants representing 5,000 species from many of the climatic zones of the world. Many of these can grow in the mild conditions of Cornwall, others demand greenhouses and that is where Eden's two gigantic conservatories come in. The Humid Tropics Biome - the world's largest greenhouse - is home to the plants of the rainforest - bananas, rubber, cocoa, coffee, teak and mahogany. Whilst the warm Temperate Biome is filled with the plants of the Mediterranean regions of the world - South Africa, California and the Med itself. The greenhouse is divided into four main display areas: Tropical Rain Forest, Four Seasons Garden, Desert Garden and Special Plants Garden. 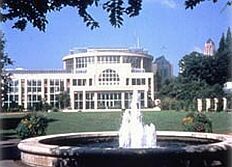 Longwood Gardens was created by industrialist Pierre S. du Pont. 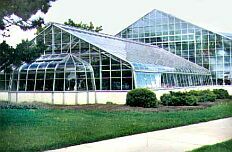 Throughout the first half of the 20th century, the greenhouses at Duke Farms were used for commercial production of orchids and flowers for the New York market. As air freight came into its own in the 1950s, the availability of cheaper plant material from abroad undercut the need for traditional greenhouse operations at Duke Farms. In 1958, Doris Duke began planning her vision for the Indoor Display Gardens, which she opened to the public in 1964. A tightly sealed glass and steel structure near Oracle, Arizona in which scientists have created seven complete ecosystems or biomes that mirror those of Earth. The systems include an ocean, a desert, a savannah, a rainforest, a marsh, an area of intensive agriculture, and a human habitat. Located next to the Lincoln Park Zoo in Chicago's largest park, this horticultural collection, including a 50-foot fiddle-leaf rubber tree dating from 1891, expands into four greenhouses. The landscape is divided into two main areas - tropical rain forest and the four seasons garden. 3500 species of tropical plants 3,500 including a betel nut forest with trees as high as 50 ft. 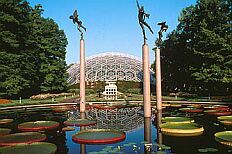 The U.S. Botanic Garden currently maintains about 26,000 plants. 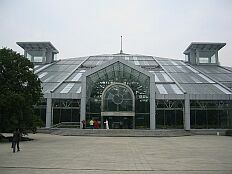 The plants are used for exhibition, study, and exchange with other institutions. The Garden's noteworthy collections include economic plants, medicinal plants, orchids, cacti and succulents, bromeliads, cycads, and ferns. The Temperate House is the UK's largest ornamental glasshouse. The main center block and the octagons at each end were built between 1860 and 1862. The end blocks were added between 1860 and 1899. Ten different environmental zones provide the cultivation and display conditions for Kew's collection of tropical herbaceous plants. Two large areas simulate hot-humid and hot-dry climatic zones, while smaller areas hold plant species with specialized environmental requirements. 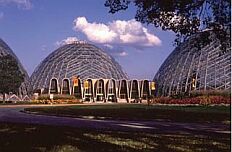 The Mitchell Park Conservatory has been part of the Milwaukee scene since the first conservatory was built in 1898. The original conservatory exhibited flowers in a "greenhouse" setting and served the public until 1955. Because it was determined to be unsafe and impractical to repair, the conservatory was demolished. A design competition, won by a local architect, produced the plans for the new conservatory. Donald Grieb's winning entry called for three beehive-shaped (not geodesic) glass domes, 140 feet in diameter at the base and 85 feet high, offering 15,000 square feet of growing space for plant display. Each dome would have a distinct climate and exhibit plants in a naturalistic setting. 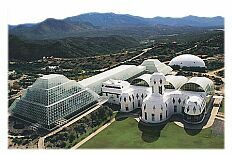 These are the Arid, Tropical, and Floral Show domes. The Conservatory has one of the largest municipally owned orchid collections in the country, made possible by donations from various benefactors including 600 orchids from the collection Anna Scripps Whitcomb an avid orchid breeder and grower. 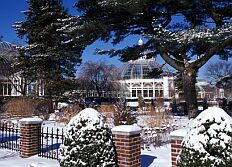 Phipps Conservatory was a gift to the City of Pittsburgh from industrialist/philanthropist, Henry Phipps. He wanted to "erect something that will prove a source of instruction as well as pleasure to the people," and the result was Phipps Conservatory, his best-known legacy. 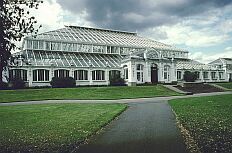 When the Conservatory opened on December 7, 1893, it was the largest conservatory in the United States and had the finest collection of tropical plants, acquired from the Colombian Exposition in Chicago. Brooklyn Botanic Garden's Steinhardt Conservatory is a passport to the flora of the world, offering visitors the extraordinary opportunity to navigate from a tropical rainforest to a desert landscape, from an aquatic oasis full of exotic orchids to a warm, temperate garden, and from a world-class bonsai museum to seasonal botanical displays. 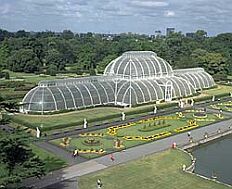 Architect Decimus Burton was responsible for designing two of the main buildings in Kew - the Temperate House and the Palm House - in collaboration with the iron-founder Richard Turner. The Palm House is the centerpiece of Kew Gardens. Its curvilinear structure is a classic example of Victorian glasshouse design. 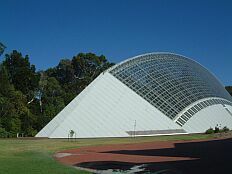 The building is called the Bicentennial Conservatory because it was jointly funded by Federal and State governments as the major iconic building for South Australia to celebrate the bicentennial year in 1988. The brief to the architect was to build a building which could contain large tropical trees and show the people of South Australia and any other visitor what a rainforest is like. Somebody Find me a better Pic! The Foellinger-Freimann Botanical Conservatory is a lovely, 25,000 square-foot, downtown attraction with three year-round display greenhouses plus hands-on exhibits. The Showcase House floral display changes six times per year. Each display has a distinct theme such as Garden Trains, Alice in Wonderland, Christmas in the Netherlands, or a Splash of Color. Permanent collections in the Tropical and Desert Houses provide lush and quiet settings for visitors to experience different climates and plant types. Hands-on exhibits introduce general plant concepts, plant uses, and a glimpse at life underground. Linnean house is the oldest continuously operating greenhouse conservatory in the United States. 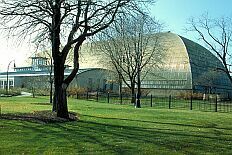 When the Climatron opened, it was one of the world's most advanced display-research greenhouses. Developed by St. Louis architects Murphy and Mackey, it won the 1961 Reynolds Award for architectural excellence in aluminum. In 1976 it was named one of the 100 most significant architectural achievements in United States history. Marjorie McNeely Conservatory at Como Park, formerly Como Park Conservatory, is the largest glass-domed garden in the region. The garden occupies approximately one-half acre under glass and includes the seasonal Como Ordway Memorial Japanese Garden and the Enchanted Garden and Frog Pond to the east. 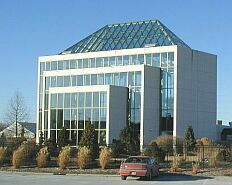 The Muttart Conservatory, opened in 1976, is a series of four glass pyramids built in the lap of the river valley in Cloverdale. Designed by Edmonton architect Peter Hemingway, the pyramidal shape was chosen for striking visual effect and the practical requirements for plant growing height. The pyramids house more than 700 species of plants in arid, temperate and tropical climates. The facility was named the Gladys and Merrill Muttart Foundation, which donated half of the original construction cost. 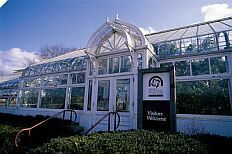 The conservatory in Eden Park, a short jaunt east of downtown Cincinnati, has been widely acclaimed as one of the finest public greenhouses in the country. It features seasonal displays of local flora and fauna as well as an excellent collection of plants and flowers from around the world, including rain forest varieties. Explore two of the world's most fragile and fascinating ecosystems: the dry heat of Madagascar's spiny desert and the lush cloud forest of Costa Rica. Plants from alpine regions to equatorial rainforests are housed in these individual glass buildings tucked into the earth. These buildings surround a sunken courtyard and tropical lagoon filled with aquatic plants. Specialty collections include alpine plants, epiphytic plants display, desert cacti and succulents, equatorial tropicals, palms and cycads, tropical fruits, ferns and aroids, insectivores, and aquatic plants. The Garden�s conservatory, "Windows to the Tropics", houses some 1900 species of plants from the humid tropics in a two-level indoor garden display. 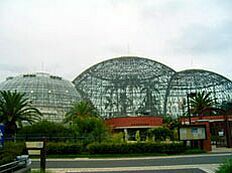 Yume-no-shima Tropical Greenhouse Dome is situated next to garbage disposal facilities, and it uses the heat from burning garbage to grow tropical plants. Offers one of the best collections of highland tropical orchids and other plants. A $1.75 million grant from the National Science Foundation funds some of the best educational exhibits anywhere. Henry Huntington began developing the Botanical Gardens in 1903. The Horticultural Gardens, as Allan Gardens was originally named, began life in 1858. Honourable George William Allan, a prominent local politician and cultural leader, offered a five-acre oval parcel of land in the centre of an area bounded by Carlton, Sherbourne and Jarvis Streets to the Toronto Horticultural Society. Bloedel Floral Conservatory, the spectacular triodetic dome capping Queen Elizabeth Park, is filled with dazzling displays of exotic plants, tropical flowers, colorful 'Koi' fish, and eye-catching birds. The Lena Meijer Conservatory at Meijer Gardens is a five-story, 15,000 square-foot facility featuring rock landscapes by designer Philip diGiacomo and plant selections by garden designer Stephen Rosselet. The conservatory houses tropical plants from around the world, including coconut palms from the Pacific, fig trees from India, exotic orchids from Central and South America, Asiatic bamboo and banana trees. Additional indoor gardens include the nation's most comprehensive carnivorous plant house, arid house, featuring Saguaro cacti, and Victorian conservatory. Plants thrive in two distinct climates inside the Crystal Bridge: the Tropical Wet Zone, which is at the south end and is watered daily, and the Tropical Dry Zone at the north end which receives water from April through September, followed by drought from November through March. The Boettcher Conservatory displays more than 1,000 exotic specimens common to tropical forests throughout the world. With three glasshouses inhabited with 12,000 square feet of plant collections, the Centennial Park Conservatory is a public place for Etobicoke area botanists and everyday flower lovers to interact with their objects of desire. One of the houses is dedicated to seasonal displays that change eight times per year. The permanent tropical display contains plants producing the juiciest of fruits, like guava, orange and lemons, a waterfall full of ferns, palms, ponds swimming with goldfish, and a display of bromeliads. The arid house is filled with cacti, succulents and yuccas. The Conservatory includes a central Palm House, a semi-tropical wing featuring our orchid collection, and two wings with changing themed displays full of seasonal color and interest. 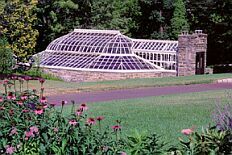 In 1986, architect Stuart Gallaher was commissioned to create the plans for a greatly expanded Conservatory and Botanical Center adjacent to the original Garden Center building. 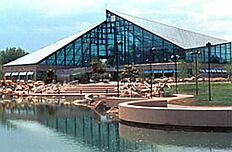 Spearheaded by a major initial gift from the Bolz Family Foundation, $4.6 million was raised from members and the public to fund the construction of a diamond-domed tropical conservatory and sunlight-filled botanical center, which opened to the public on November 1, 1991. Luxuriant tropical foliage fills the 10,000 square foot Conservatory. Explore the winding paths to discover a kaleidoscope of orchids, bromeliads and exotic trees from around the world. Note: Poor Resolution from Google No Pic Available! The Conservatory began as a community effort in 1914 to provide a place to house exotic plants that residents collected during their travels abroad. The present Edwardian-style glass structure, built in 1929, houses a botanical collection of more than 3,000 plants, some of which date back to the Conservatory�s founding. Our signature garden, the tropical Sun Garden, is one of the world's most unique conservatories. The 6,444 square foot Sun Garden features islands of gardens, a beautiful 14-foot waterfall, reflecting pools with Japanese Koi fish and a 70-foot skylight peak with ferns, palms, bromeliads, orchids, frangipani, bird of paradise, banana plants and hundreds of other exotic tropical wonders! No modern pic is available. It doesn't look like this anymore. (1954) The west end section was a cool temperate house to display camellias, gardenias, and flowering shrubs. The west-center section housed war tropicals: orchids, anthuriums, and flowering vines. The large central section was the equivalent of the great Octagon house of an earlier day. With a ceiling at 30 feet, it could accommodate large palms and tropical trees. A 40-foot long shallow pool with showering fountain was edged with plants and a perimeter walkway. This impressive 'jungle room' was the heart of the new Durfee. Adjoining this area towards the east wing were two more houses: one for small tropical potted plants (begonias, geraniums, etc. ), the other for cacti and succulents. 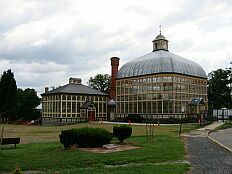 The historic Lord and Burnham Conservatory complex, built between 1903 and 1915, is considered one of the most important residential greenhouse complexes in the United States. Although a large portion of this structure is patiently waiting restoration work several rooms are open. 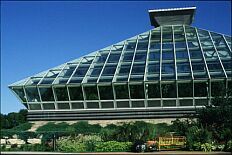 These include the domed Palm House, the Cacti House, and the current Orchid House. I just can't find it... No Pic Available! 38 foot high glasshouse dedicated to ultratropical fruit trees. 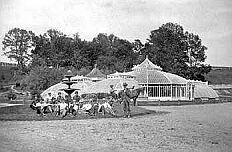 Beneath a curved Victorian glass roof, lies a hidden pleasure garden that turned 100 years old in June, 1999. 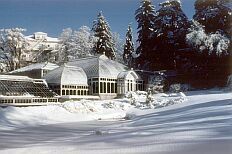 The Dorrance H. Hamilton Fernery is the only remaining freestanding Victorian fernery in North America. The Fernery documents a time when Victorians were consumed with ferns and glasshouses. Designed by the original owner and namesake of the Arboretum, John Morris, the Fernery embodies some of the many passions of the Victorians: a love of collecting, a veneration of nature, and the fashion of romantic gardens. Designed by Biltmore House architect Richard Morris Hunt, the glass-roofed conservatory contains rooms for a variety of plants ranging from towering palms to delicate orchids. The South China Botanical Garden is building the largest greenhouse in Asia, which will cover 10,000 square metres. 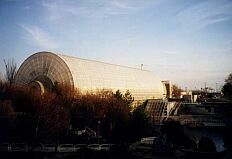 The greenhouse, which is due for completion at the end of next year, is divided into a tropical greenhouse and semi-tropical sections, as well as a desert plant house and an alpine plant house. The tropical greenhouse will account for about three-quarters of the total area and be home to 3,000 to 4,000 different kinds of flora.